Late Thursday night, Gary Leff posted on View from the Wing about an insane offer though GOL Smiles (GOL is a Brazilian airline and Smiles is their Frequent Flyer Program) and Rocketmiles (a site where you earn frequent flyer miles for hotel stays). The deal is Triple GOL miles which in some cases is a LOT of miles. An early glitch in the promotion meant insane amounts of miles for the dollars spent, including offers of 150,000 miles a night for hotel stays of around $700. This meant you could buy miles on GOL for about half a cent and have a free hotel stay to boot. On Friday they fixed the glitch, confirmed all stays already booked would be honored, and also clarified that this promotion was open to US residents (despite the terms saying Brazilian citizens only). The promotion ends tonight (I assume at midnight) and the thing is – there are still some pretty fun deals to be had. If you are thinking about doing this, please read Gary’s posts (both of them) above for more details and some reader questions and answers. I’m dedicating this post to how you may be able to best take advantage before this expires tonight. You will need to open a GOL Smiles account (for which you’ll need your passport # handy) but using Chrome’s built in translate feature, I had no trouble and the account was available instantly. You’ll need to specifically book via this link to get the 3x and also please note, this is open to first time GOL Smiles / Rocketmiles users only and it will only apply to your FIRST booking – so make it count. Stay must be before September 15th, according to the terms, though it seems to be allowing stays for later. Screen shot anything you do just in case! I’m booking a 3 night stay in Los Angeles that will net 306,000 GOL miles for a stay costing $3,000. Now, the room I’m booking is certainly not worth $880 + tax a night. And I’m not 100% sure I can be in LA that weekend, so I’m being sure to book a cancelable room. I may wind up on the sidelines after all, but I’m in the game as of now. I’m effectively buying miles at 1 cent per mile, plus getting a free 3 night hotel stay in the process. At least that is the way I’m looking at this. And while the room is prepaid (and I’ll pay with my Chase Sapphire Reserve to earn 3X Ultimate Rewards – 9,000 in all worth $135+) it won’t actually be due in full until my statement cycle in mid-September, meaning I won’t really have to pay in advance if I don’t use the room. One important caveat is that the terms clearly state that bonus miles will only be in your account for 6 months – use them or lose them. But that’s just to book, not to take the flight. 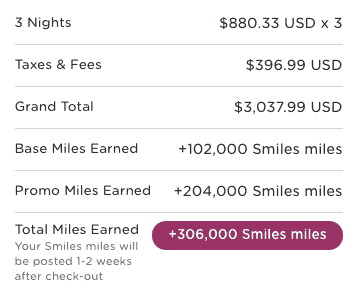 Also, worst case, you can use the miles on a future hotel stay through Smiles/Rocketmiles – albeit not as a good of a redemption value. So what are GOL miles worth? Well, the reason I didn’t jump to book this Thursday (and missed the bigger deal in the process) is because I had no idea. But now I do. GOL is part of Skyteam, so you can redeem on Delta, Air France, KLM, Korean Air, etc – as well as some interesting partners like Etihad, Emirates, and Qatar. I was hoping this would be a hidden steal for the luxury Middle East airlines, but it’s not. Flights are not a deal on them – though for Emirates at least, which doesn’t have many ways besides SPG to book, it’s a solid additional option. GOL doesn’t seem to add surcharges. A Korean Air flight in Business non stop from New York to Seoul prices at 100,000 miles and a few bucks in tax. Not a bad deal! Interestingly, you could fly from JFK-ICN via Detroit on Detla’s brand new A350 plane for 130,000 miles – while Delta is charging 240,000 miles for the same flight! My research uncovered so many anomalies with pricing that I gave up trying to deduce exact pricing rules, but a few rules held, like 100k each way to Seoul on Korean. You can also redeem on Delta, which is a great way to burn any miles left close to expiration domestically. And there are some deals! I found just one Delta One non-stop in August JFK-LAX at low levels. But while Delta was charging 45,000 miles, the same flight with GOL Smiles miles was just 35,000. US to Europe in Business Class appears to be 85,000 miles each way. Another cool feature is the cash and miles option (the right most box on all these screen shots). So let’s say I want to use this for two people to Europe in Business Class. But I’ll only have 306,000 miles and need 340,000. I can book one of the one ways at 51,000 miles + about $300 USD. Makes it all work and it’s effectively buying miles at 1 penny a point. So, that’s not a beginner level guide by any means, but if you have the drive and inclination, you can definitely find yourself into a business class ticket to Europe for about $1,700 or Asia for $2,000 (on Korean) round trip with an effectively free hotel stay. Will you be booking something like I did? Let me know in the private MilesTalk Facebook group or in the comments.